Christmas. A time for togetherness and heart-touching duets, yes? Actually, no. 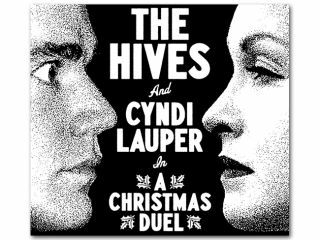 Everybody's favourite Swedish rockers The Hives and fun-wanting-girl Cyndi Lauper have teamed up to record A Christmas Duel: a fight-filled Yuletide number available as a free download between 28-30 November. A statement from The Hives reads thus:"It may sound weird and come as a surprise to some, but we had to. It came to us. It landed in our lap and was way too good to shake or toss. We knew we had to record it. A sign if you will." Cyndi Lauper added this: "This goes to show even rat sideswipers can have a good Xmas too." We have no idea what this means. Regardless, after the download, general sale commences 1 December.